My Father is a boxing fan. So I grew up as a little boy going to fights, watching them on closed circuit TV and, (yes I’m old enough to remember) listening to them on the radio. 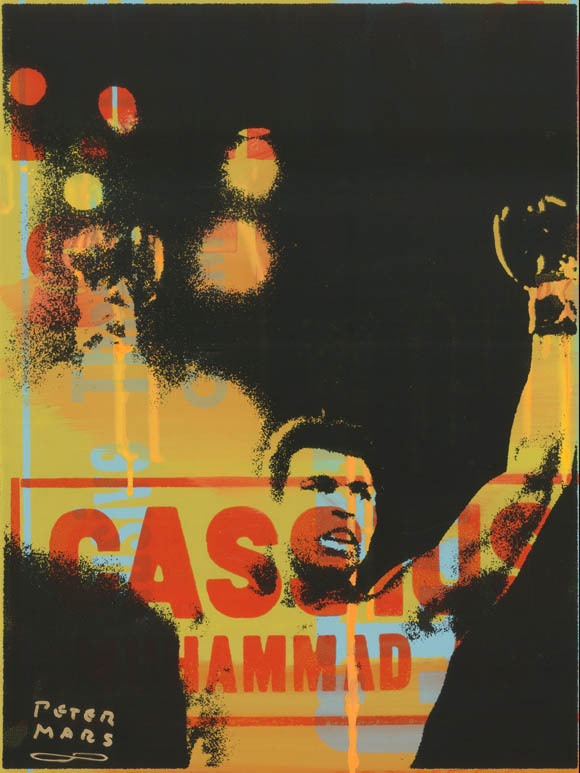 Cassius Clay was one of my Dad’s biggest heroes, and as I came of age during the Vietnam years, I quickly understood why this made sense, and what a profound American hero Ali truly is. 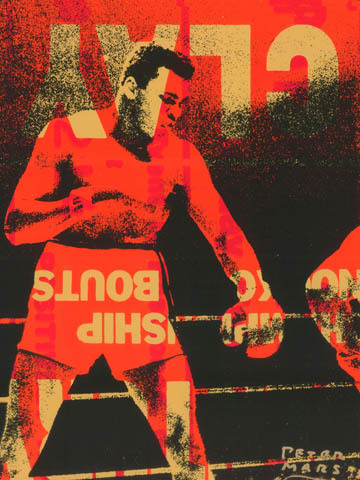 Fast forward to a meeting in 2008 where my agent asks me, “If you could do an in-depth project with any athlete in the world, who would it be?” The words “Muhammad Ali” literally fly out of my mouth. Within a year he has me sitting in the Madison Avenue offices of Muhammad Ali Enterprises, where we inked a deal for me to be an Official Artist to the Ali family archive. I dreamed of this opportunity for so long that it felt completely surreal to be sitting in Ali’s offices now, being granted permission to use images directly from Muhammad Ali’s personal archive. The boardroom was beautifully appointed, all quiet and relaxed, but I just couldn’t shake an eerie feeling that, in theory, The Champ himself could bust thru a door at any moment, and either shake my hand with a big smile, or punch me in the head and knock me out cold. So I just took some deep breaths and tried to stay calm enough to listen to the meeting. I daydreamed back to one of my Mom’s favorite stories about seeing Mr. Ali and his entourage walking through a Las Vegas casino late one night. She described him as “the most handsome man I have ever seen.” Recalling the story seemed to calm me down a bit. In the meeting I could hear people talking about how I would be able to use their archive. 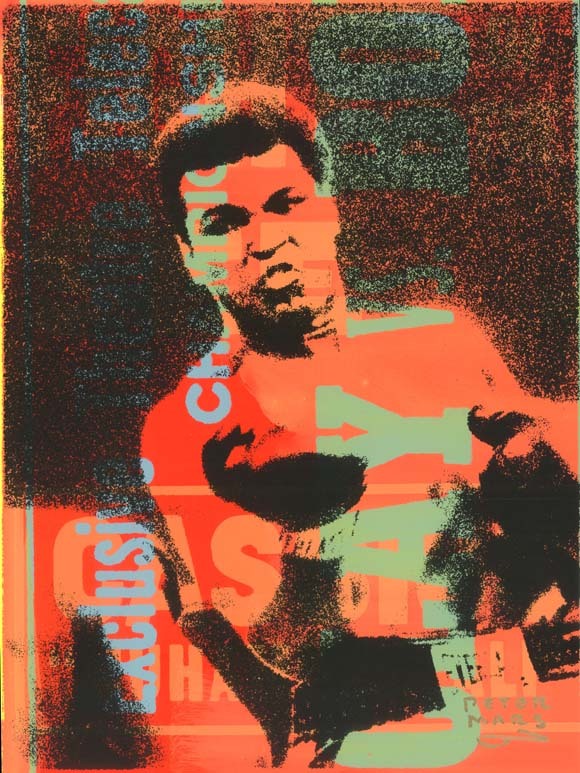 Muhammad Ali’s archive spans his entire career beginning with his amateur bouts in Louisville Kentucky, thru all the landmark fights, The Thrilla in Manila, Rumble in the Jungle, and his Civil Rights battles that would define an entire generation. The people in the boardroom start showing me examples of images from the archive. And at first I really could not believe that I was even being allowed to see these images, let alone use them in my art. The whole experience transported me to a place where Ali is maybe sitting at his coffee table on a lazy afternoon, kindly showing me through his personal photo albums and scrap books. Again, the only word I have for it is surreal. The material is rare and amazing. Here they are, literally thousands of photos taken of Ali in the ring. Here he is on the stand accepting the Olympic Gold Medal in Rome 1960, here he is riding in a ticker-tape parade through downtown London, next, relaxing at home with friends, then shadow-boxing with Elvis in a Las Vegas hotel room, and finally here he is meeting with historic figures like Malcolm X, Elijah Muhammad and every sports-world dignitary you can image. How could it be that same little boy in me, who had watched Ali from afar, and across a lifetime, was now paging through these photo albums, excitedly thinking of turning this story into Art? Very shortly my excitement turns back again to fear. This time the fear is reminiscent of the “we’re not worthy!” scene in a Wayne’s World movie. How can I possibly even try to tell this story with my art? Ali is superhuman! He’s larger than life both in and out of the boxing ring! He is a man that our popular culture frequently compares to Superman!… mostly because people have just plain run out of words to describe him. And I’m supposed to make paintings that tell this man’s life’s story? …one of the most important stories in American History? We rode the elevator back down to Madison Avenue, my head still buzzing. After the shock wore off, I got started. And the images I’m showing you today are the results of the past 4 years of my labor on the project.